Home English Prabhas Bollywood movie in Rajamouli direction? Bollywood audiences are yet to come out of Baahubali mania. SS Rajamouli’s visually spectacular period drama left strong impact besides setting box office ablaze. The film continues to be India’s biggest blockbuster having collected 1700crores worldwide. Prabhas become nationwide rage with his gladiator kind of a larger-than-life roles in both the parts. 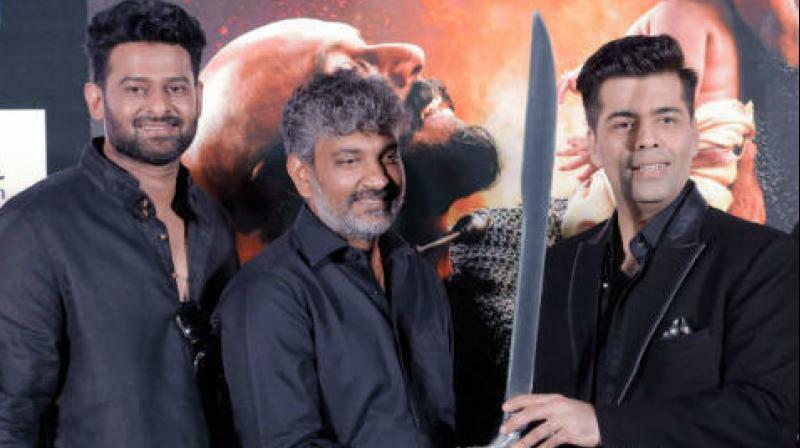 Karan Johar who presented Baahubali in Hindi has been trying to make Prabhas act in a straight Bollywood flick but things didn’t materialize. The Telugu hulk has been busy with Saaho and his 20th film. Several B-town filmmakers have approached Rajamouli asking him to direct a film for them. Jakanna has launched his multi-starrer with Ram Charan and NTR. Tentatively titled #RRR, the film is planned for release in 2019. As per latest buzz doing rounds in Mumbai film circles, Rajamouli is expected to take up a Hindi project after this. Guess what? Prabhas is said to be the hero of this film and Karan Johar will be bankrolling the project. Recently, Prabhas appearing on Koffee with Karan along with Rana and Rajamouli further fueled these speculations. Previous articleఒడియ‌న్ డిజాస్ట‌ర్.. మోహ‌న్ లాల్ కు మామూలు దెబ్బ కాదు..
Next articleఅన్న‌గారా మ‌జాకా.. పోస్ట‌ర్స్ తోనే ఫుల్ బిజినెస్..